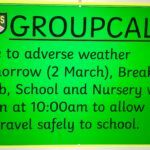 Due to adverse weather tomorrow (2 March), Breakfast Club, School and Nursery will open at 10:00am to allow staff to travel safely to school. Bad Weather Information Please see attached document for further details. 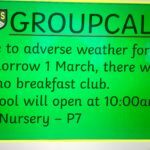 Due to adverse weather for tomorrow 1 March, there will be no breakfast club. School will open at 10:00am for Nursery – P7.